The Modi government has started a new scheme to develop the transport in rural areas. 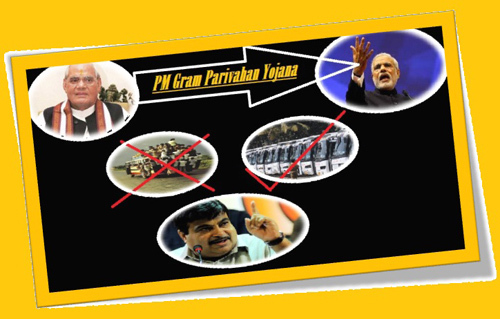 Pradhan Mantri Gram Parivahan Scheme is one such yojana that will provide subsidies to the rural transportation. Proper roads or any other way of transportation will be the strong initiatives for development. In fact, still there are many rural villages of India don’t have proper transportation medium because of not having roads. In this scheme women also can get opportunities. Under the scheme the central government will provide loans to the commercial vehicles in rural areas across the country. So to get the facility under the scheme the vehicle must be a commercial vehicle. The vehicles must not contain more than 10 people as passengers. That is there must be maximum of 10 seats in the vehicle. No heavy vehicle that contains more than 10 people should be eligible. Also the vehicles must run 20-22kms every day that will connect at least 10 to 12 villages in different blocks or within a same block. The scheme will also facilitate women population in rural areas. PMGPY will provide interest free loan to the women self-help groups so that they can buy commercial passenger vehicles for their business purpose. The Government will choose tribal, women self-help associations and BPL families for operating these transport services successfully. Around 80000 commercial vehicles will be offered in the country side regions. Pradhan Mantri Gram Parivahan Yojana is an extended scheme of Pradhan Mantri Gram Sadak Yojana. After the development of rural roadways now the government will enhance the transportation service of rural areas. Currently under Pradhan Mantri Gram Sadak Scheme nearly 80 kms roads are being built per day. The authority is trying to increase this to 138 km per day. Further, it provides employment and basic income for the locals of the area or village. Initially, the scheme will take off from Bilaspur district in Chhattisgarh and then it will cover approximately 20 locations of the North-eastern states. Under this scheme vehicle loan will be provided for commercial purposes. Also it is said that the interest subsidy will also be provided so that people can easily repay the loan on time. This will lead to employment generation and more working opportunity for the women population. As mentioned under this scheme women can get interest free vehicle loan for commercial purpose. Also the scheme will enhance the public transport facility in rural areas across the nation. Now it will be much easier for any villager to communicate with other parts of the nation. Under the scheme the applicant will get loan up to Rs. 6 Lac. According to the rule of the scheme the tenure of the loan will be 6 months. Loan must be used to buy a commercial vehicle that must contain 10-12 people. The loan under the scheme will be short term loan. Also the subsidy on interest will be high as well. This scheme will also generate employment opportunity in rural areas. Women and financially backward people will get benefitted from the scheme. According to the scheme 1500 commercial vehicles in rural areas will get loan facility under this scheme. In 250 blocks across India the scheme will operate. In future it may expand to 80000 vehicles across the nation. Along with loan facility the central government is providing interest subsidy as well. In every loan for the commercial vehicle interest subsidy of 30% to 35% will be given to the applicant. That means whatever be the interest the person has to bear only 65% of the interest amount. The rest amount will be paid by the central government. The launch of PMGPY scheme will be of great advantage to most of the people, especially children and women who survive in distant locations. Lack of transportation may leads to face lot of issues when travelling to school, work or other places. But with the launch of this plan, travel is turn out to be an easy thing as because of the introduction of public vehicles. Locals of the remote areas can purchase public vehicles at low cost prices and it is another benefit of this transport scheme. Women BPL family members can get employment and income under this scheme. As per the thoughts of economists and NGO’S across the nation, it is a good sign for rural India’s development. At the same time proper guidelines and governance should be followed and provided in order to ensure scheme reaches the goal. Unfortunately compare to the length of road there is much less or no vehicles are available for any purposes, especially commercial purposes. This scheme will generate vast opportunity for the people living in rural areas to enhance their trade and business. How can i avail this scheme? Whom will i have to approach? How we can avail the pradhan mantri gramin parivahan yojna commercial vehicle loan . and whom to apporach for loan .